Meet the grammar gang – a tough-talking crew of characters who put words and punctuation marks in their proper place! There’s zesty Verb, always at the centre of the action, and structure-loving Syntax, the organised one! The latest in urban artist Simon Basher’s bestselling manga makeovers of school subjects, this quirky book gives a streetwise face to all those confusing grammatical rules, from parts of speech to sentence components, groupings and agreements. 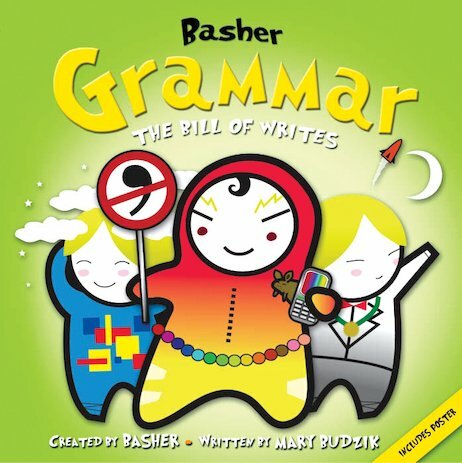 Ascribing a cool personality profile to each grammar basic, and letting it explain its usage in its very own words, this is a truly creative and entertaining look at grammar, which helps children to distinguish each rule, and remember what it does.